Goji berry superberry. Paraben and SLS free. 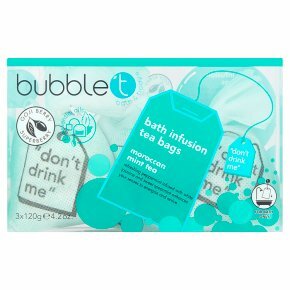 For bath only.Morrocan mint tea Refreshing peppermint infused with white jasmine and sweet spearmint enhances your senses to energise and revive Bath infusion tea bags Two of the best rituals in the world, bathing and tea are brought together in this set! our unique combination of tea and fruit notes are blended with sweet peppermint and Goji berry extracts to deliver nourishment to all skin types. Directions: Drop a bag under warm running water and allow a short time to diffuse which will lightly fragrance and soften the water. Remove tea bag before getting into water and soak your body in the bath to relieve any aches and pains. "Tea is liquid wisdom, just add water" Pease retain this information for future reference. This is not a food, do not eat.<br><br>Keep out reach of children<br><br>Caution: this product is for external use only.